If you're a voracious reader, few things are more satisfying than free books to read. Here is a collection of websites that frequently hold book sweepstakes. Free book giveaways are a great way to find out about new authors and try different genres and literary styles. If you have a favorite website that offers their own book sweepstakes, email me and let me know. I might add it to the book sweepstakes list! If you have won a free book, from one of these book sweepstakes sites or from any other source, make sure to take the quick poll, Which Book Sweepstakes Sites Have You Won From? at the end of the article. GoodReads.com is a website where you can track the books you've read, find news about your favorite authors, and keep up with the books your friends are reading. GoodReads also gives away lots and lots of free books in genres like non-fiction, romance, science fiction, and literature. Most of the book giveaways on GoodReads.com are pre-release books which publishers and authors offer to get early reviews of their novels. You're not required to write reviews of the books you win, but it is encouraged. You can sort the giveaways by Ending Soon, Most Requested, Popular Authors, and Newly Listed. If you sort by Most Requests, you can go to the end of the list and see the books that have fewer people trying to win them, and thus, better odds. Most of the GoodReads book giveaways are open to US residents, but some are also open to Canada, the UK, and other international entrants. BookDivas is a book-lovers' website that features author interviews, book reviews, tips for breaking into the writing industry, and more. BookDivas also shares the love of reading by offering free book sweepstakes. You can sometimes find writing contests on BookDivas as well. The books I've won from this company usually have a pretty bookplate inside saying that the book came from BookDivas, and many also come with a handy BookDivas bookmark. Both of these things are nice added touches. Check the rules to be sure, but most BookDivas book giveaways are open to international residents aged 13 and above. FreshFiction.com offers book reviews, author chats, book news, and book contests. They specialize in genre fiction such as romance, science fiction, fantasy, horror, thrillers, and more. FreshFiction gives authors the chance to offer book sweepstakes on their site. Sometimes, these sweepstakes include other prizes as well as books, like cash, gift certificates, and gift baskets. Many times, you need to agree to receive emails from the authors to participate in the giveaways. FreshFiction also supports authors by buying books at signings and offering them in their own giveaways. The last three months of book winners are also listed on the FreshFiction contest website. BookLoons.com offers book reviews, book columns, and excerpts of books for adults, teens, and kids. They also have an extensive listing of book sweepstakes that covers their own sweepstakes and book giveaways on other sites. The sweepstakes listings are divided up into sweepstakes for adults and for younger readers, which makes it easy to find age-appropriate contests to enter. Because the book sweepstakes list on BookLoons covers many different sites, there are no standard entry restrictions. Read the rules of each sweepstake to see if you're eligible to enter. Christianbook.com is a catalog company that specializes in Christian products. They offer a selection of free book giveaways on an ongoing basis, as well as other prizes like getaways, cosmetics, and more. The book giveaways cover fiction, self-help, and non-fiction genres. Many of the Christianbook.com book giveaways are open to residents of the contiguous US aged 14+, but that can change, so check the rules before entering to be sure. HarperCollins Kids is the division of book publisher Harper Collins that focuses on children's books. The Games and Contests section of the HarperCollins Kids website gives entrants the chance to win free kids' books as well as other types of prizes. Check the rules to be sure, but it looks like most of the HarperCollins Kids giveaways are open to residents of the US, with some states restricted. It doesn't look like there are age restrictions, so kids can enter as well. If you're a fan of popular author James Patterson, you'll be glad to know that he offers chances to win free books regularly on his website, JamesPatterson.com. To enter, you need to sign up for his newsletter and/or join the James Patterson community. James Patterson book giveaways are often open to residents of the US and Canada aged 13 and above. Check the rules for details. Tip: Many other authors offer free book giveaways on their sites as well. Check your favorite authors' websites to see if they have any books you can win. Leite's Culinaria is a foodie website that offers recipes, articles about food history and science, virtual cooking and writing classes, and more. Every month, Leite's Culinaria gives away a selection of cookbooks, as well as other kitchen prizes. Their cookbook giveaways generally offer daily entry to US residents over the age of 18 (but check the rules to be sure before entering). WriterSpace is a community of over 550 authors, mostly in the mystery and romance genres, and their fans. Many of these authors offer free giveaways of their books to spread the word about their writing. The giveaways offer autographed books, Amazon gift cards, and other prizes that readers would love. A list of winners from the previous month is also available on the WriterSpace Contests website. Penguin Books ​Ltd holds a free giveaway every month, which is open to adult residents of the United Kingdom. A few ARC copies of a different book is put up for grabs. The winners are usually chosen within the first week of the following month. 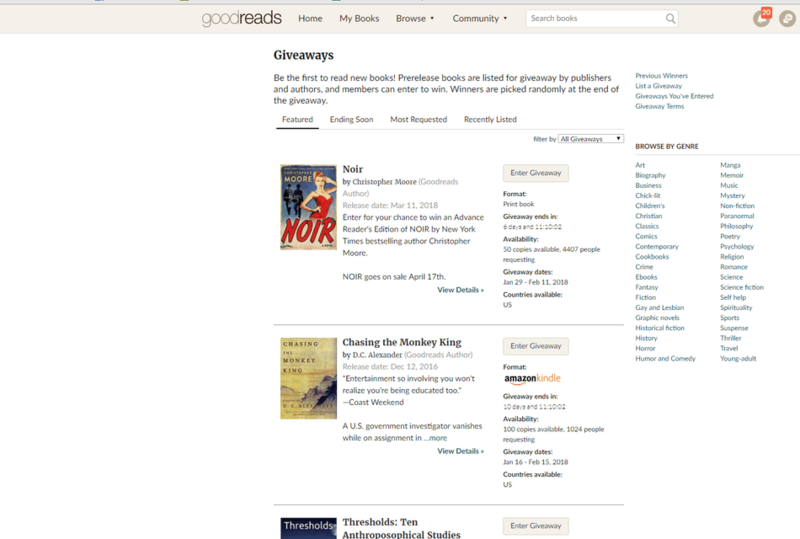 Like GoodReads, LibraryThing gives authors the chance to offer giveaways of their books. Many times, these are advanced reader copies (ARCs), and an online review is expected in exchange for the free book. Books are available in all genres, and both fiction and non-fiction, so no matter what you like to read, you're likely to be able to win it here. Riveted by Simon Teen is an online community for people who love young adult fiction. They give away free young adult fiction books on a regular basis. Check back frequently for new chances to win. Is Sweepstakes Advantage Worth Your Time and Your Money? What's the Difference Between a Premium and a Standard SMS Charge?